The Croatian caver who was injured deep inside the Kita Gaćešina cave system in Croatia’s Velebit National Park has made it to the surface. Despite initially expecting to take many days, at 5:23 am this morning, just 26 hours after rescuers were notified of the incident, injured caver Marijan Marovic, made it to the surface. 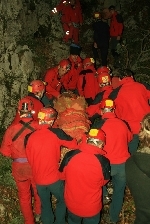 The 29-year old caver suffered a spinal injury while climbing, when an anchor plate failed and he fell. He was part of a 14 member research team that were about 520 meters (1,700 feet) below the surface, and 2 kilometers (1.2 miles) into the cave when the incident occurred. All told, about 150 rescuers from the Croatian Mountain Rescue Service were part of the operation that involved enlarging some of the narrowest sections to allow passage. The entire operation completed under the watchful eye of a doctor who provided medical care and helped prevent further injury.